A beautiful door, sunshine, a pea gravel garden path! or pathway in a garden? it must be the small crunching sound it makes. I like this vision of heaven! Looks peaceful, inviting & like God has cool design taste. Oh, I agree. There is something about a pea gravel path, isn't there? And those windows! Wow. It is a glimpse of heaven. The view is a focal point on axis. An enfilade, a view thru to a view. A simple , and effective, landscape design tool. Yes, gravel/door are nice but the photographer chose the enfilade. Wnet on a long walk late last noght in the mountains.... found myself drifting to the gravel roads... all to hear the crunching sound under foot. It brings you to a place of tranquility. I love this picture.... It feels like you're in Belgium. Believe me, I have this door saved in my computer, it's one of my favorites. I subscribe to your blog and saw this yesterday and thought, hmmmm, what wonderful, tranquil, meditative corner of the world has Patricia wandered off to for a bit of r&r? Perhaps the Biltmore in Phoenix or a spa in California? Well I see the source and can certainly understand your admiration for the photographer & the locale. Thank you for sharing. SO beautiful!! 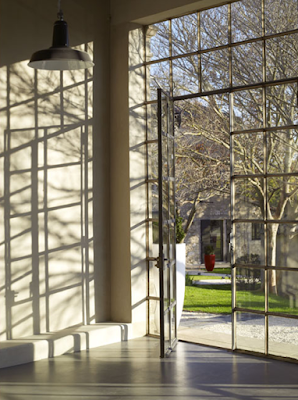 I have always wanted to incorporate a wall/window or even door like this into a house - and the shadows - really lovely!! In our new home we have a huge wasll of windows and I love it. I'm a tad concerned it will bleach out my fabrics and wood floors with so much sunlight but it's just so pretty! Heavenly indeed!Very simple yet so relaxing interior design. Absolutely wonderful, natural light through the windows what stands out for me. This place is so beautiful, I really love it, nice picture. Thanks. Although it's a little bit blur,I would say that the photo has offered a chance to imagination for all the viewers. What a wonderful place!!! Great!!! Nice View! what a beautiful place! Thank for sharing! i love ur blog and ur picture .... iam an interior design to but i finshed my studies overseas (egypt) and then moved to Australia and i find it so hard to find a job cuz i didnt study here:(. but i really love pictures. Love your vision of heaven,it is the perfect place to meditate,the light playing shadows on the walls and on the floor through this beautifully designed glass facade is surreal and brings a feeling of plenitude.